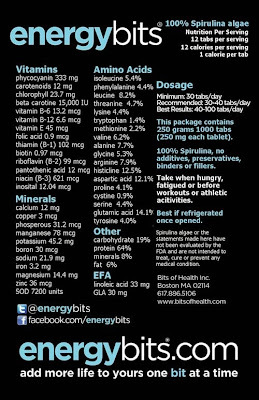 Back in August I began to notice that there was quite a bit of chatter on Twitter about @Energybits as well as #poweredbybits. Having decided to step up my running and having committed to my first marathon (13th Annual Lost Dutchman Arizona Marathon), I was on the lookout for products that would help fuel the increase in mileage that was going to be required. Intrigued based on the positive feedback of so many runners, I checked out the ENERGYbits® website as well as poked around the old interwebz and liked what I saw. At this point I made contact with Jonathan Levitt, their Brand Manager/Social Media Director to see about getting some samples. 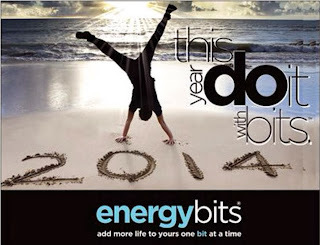 Now before I get into my results, some of you may be asking yourself, what exactly are ENERGYbits®? Well, here's the skinny (literally). 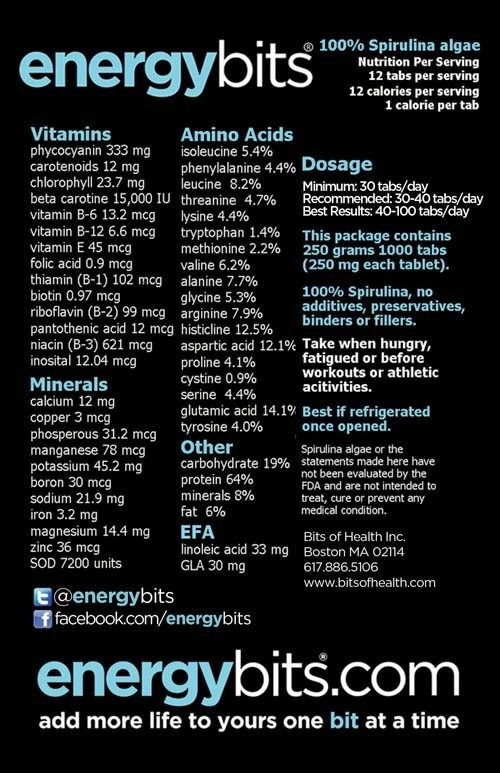 ENERGYbits® are made from 100% organicallly grown spirulina algae and loaded with 40 nutrients, ENERGYbits® algae tabs have the highest concentration of protein in the world (64%) all for just one calorie per tab. Endorsed by the United Nations as the most nutritious food on earth, spirulina algae has been a favorite of Olympic gold medalists for decades and is a super food in every sense of the word, delivering instant and enduring energy to your brain and body. Pretty cool and if spirulina algae is good enough for elite athletes, it should be good enough for a half-fast, mid-packer like me. Armed with the 5 sample bags of 30 bits I purchased, I began my trial. The first time I tried them, I didn't really notice any "fishy" taste or smell that some people mention; I just popped 15 in my mouth and downed them with a glass of water just before I began to stretch. After about 10 minutes or so, I could feel something, but not that sped up feeling you get from caffeine or sugar. More like I didn't feel tired; I just felt good. The run that day was a 3 mile progressive run and I felt strong. What I noticed the most was that I wasn't as winded as I normally was. Also, my heart-rate and breathing came down to normal quicker. Good outcome but how much of it was the placebo effect I wondered. Well this theory was soon put to rest as I continued to take bits for my runs/XT during the week with the same results. I'd feel strong and recover quickly. They were working so well that I was sold and ordered a full bag of 1000 bits. So here I am, having been using ENERGYbits® for the past 4 months and still feel as good about them now as I did when I first tried them. And as my weekend runs are now in the 10-20 mile range I also take 20 bits every 6.5 miles for a nice pick-me-up. Another reason I know that ENERGYbits® make a difference is that I ran out of them for a week in the beginning of December and my energy level during this period was definitely not the same when I ran or did an XT session. The PR's I've had at 5K, 10K, 12K and 13.1 mi in the last 4 months don't lie either. Ok, so here's the giveaway, the first 3 people who comment here AND email me at TheHalfFastRunner@gmail.com with their contact info will receive a FREE sample tin of 60 ENERGYbits®. For anyone who just needs to replenish their supply of ENERGYbits® (or RECOVERYbits®, VITALITYbits®, SKINNYbits®) going into 2014, can use promo code HalfFast for 30% off all products at ENERGYbits.com. I'm confident that you will like these as much as I do and you'll want to add them to your fitness routine. I'll also be happy to answer any questions you may have. 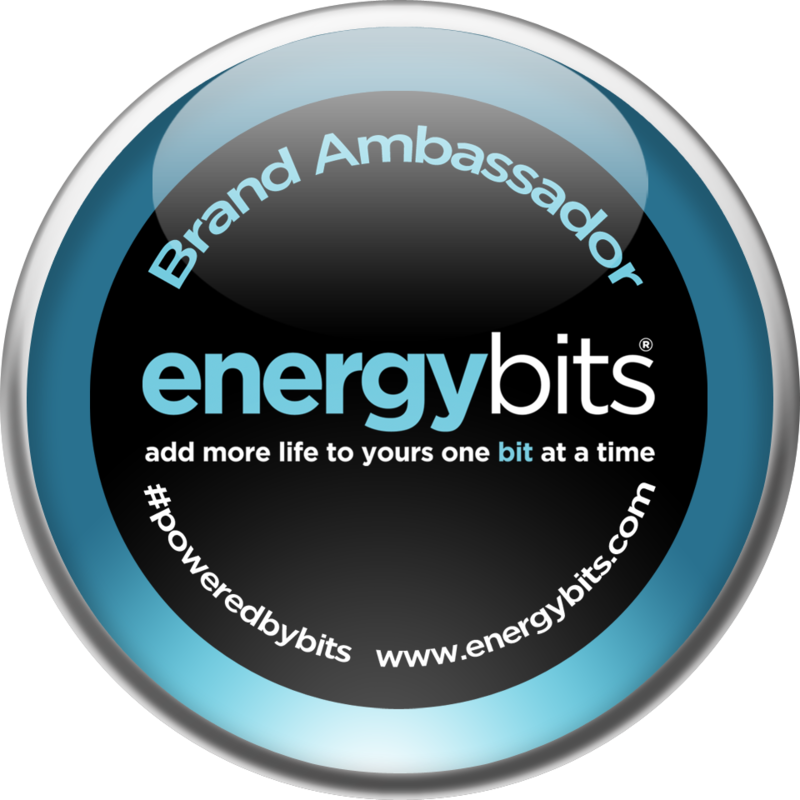 Disclaimer: As an ENERGYbits® Brand Ambassador I do receive indirect compensation through use of my promo code HalfFast. However, I do use these for all my running and XT and the opinions here are based on my experience. Also, ENERGYbits® are considered supplements and as such are not intended to diagnose, treat, cure or prevent any disease or medical condition. Your results may vary. Always seek the advice of a qualified professional for any health concern and share with your health provider any information pertaining to your health and well-being, including the use of supplements. Welcome all to The Half-Fast Runner blog. I had been kicking around the idea of doing a blog for my running, gear and companies I like as well as running related articles and tips that I find helpful. As the title of this blog implies, I am far from an elite runner and the same could be said for my writing. In fact there are chimps that can type better than me and some probably run better too. I got back into running in 2012 after a 29 year hiatus. Back when I was younger, it was a chore, something I had to do; today I run because I enjoy it and it's relaxing. Another thing I really enjoy about running today is the community and camaraderie of runners on social media. There are so many great people all over the world to interact with as well as get advice and tips to be better at the sport (yes, running is a sport). So I hope my little blog is able to add something to the conversation, provide some useful information and maybe a few laughs as well. One thing I try to keep in mind, and I hope you will too, is that it's not about how fast you run or how far you run; it's that you have just made the effort to go out and run.